I’ll have to admit to being more than a little harried this Christmas. The kids took notice of the holiday for the first time and despite repeated commentary about the “reason for the season,” the presents took over. Especially when the grandparents got into the act. Our home is awash in noisy, plastic, branded merchandise. They’re loving it. So how does this fit into my normal posts about leading an easy and elegant life? My Christmas wish for next year is a little quiet time, especially with the kids. Maybe singing a few carols on Christmas Eve — my Mom plays the piano and can work her way around my keyboard with ease. 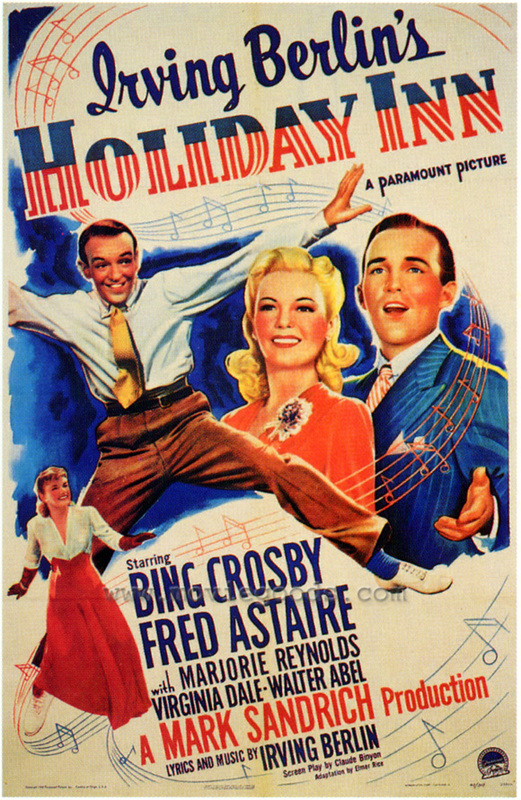 Today’s recommendation is “Holiday Inn” starring Bing Crosby and Fred Astaire with music by Irving Berlin. To paraphrase the “review” the Inn gets: “Don’t ask why, just go watch. And God Bless America.” Yes, there are a couple of cringe inducing moments (Lincoln’s Birthday in blackface…..) but on the whole it’s a wonderful piece of filmmaking and costuming (if Mr. Astaire’s elegance can be so classified. He looks modern when many of his co-stars would stand out today.) So treat yourself to a little luxury after the madness. This entry was posted in Elegantology and tagged Bing Crosby, classic movies, Elegantology, Fred Astaire. Bookmark the permalink. I searched for screen shots of this movie over the holidays as the “Inn” is one of my favorite movie houses. One site said TMC owns it, but rarely shows it because of the black face scene. A shame – it is a charming movie.